For the first time ever, I’ve interviewed a “sassy” male guest! 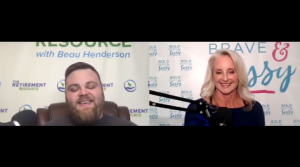 Beau Henderson is a Money and Business Coach, Best Selling Author, and CEO of RichLife Advisors who is passionate about improving FISCAL and PHYSICAL health for not only his clients, but also the youth of our country. On the show we have a very important conversation about how generations of families can get stuck in destructive patterns of thinking and acting because they never received the education to know how to live in a healthy physical and financial way. What is so great about our conversation is how Beau and I have such a similar approach to helping people in our chosen fields. What you do to start and execute a sound financial plan can also be applied to beginning and creating a healthy living plan too. 3. Starting a health routine and a financial plan execution routine, it’s nearly the same thing. We have to determine where we are going, what we need to do over and over to get there and understand what will likely get in our way before we start so we can be prepared to overcome them when they show up! From there, we also discussed everything from mindset, beliefs, what people at the end of life wish they would have had more of, and the why it’s important to raise both our financial and health IQ’s for a more gratifying and happy life. Beau is one smart and caring man, and I know you’ll enjoy hearing from him. Get a hold of Beau’s book. It’s free, just pay shipping!